The tuition fee for the entire M.Sc. Program is 30.000 € (thirty thousand EUR). Please note that this fee is tax-deductible. For further information about fees and prices please contact us. 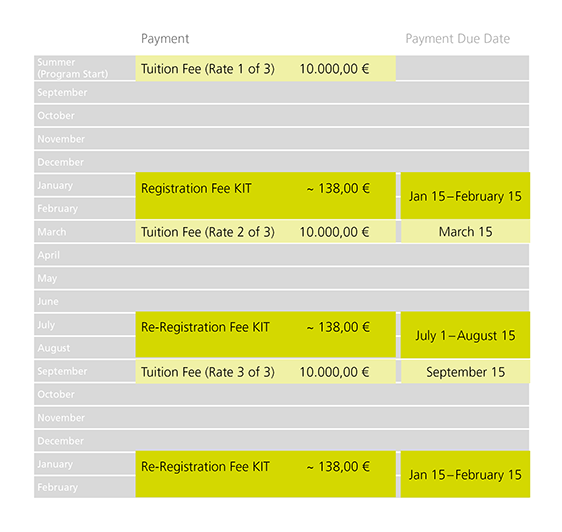 To better organize your finanical payments of the fees applicable for the participation in one of the HECTOR School master programs, we generated the exemplary payment plan above for you. In case of further questions, please don't hesitate to contact admissions consulting.